New Estate Vineyard program, new faces, and a cyber-facelift combine as the Walla Walla Valley winery matures. The new brand look and feel will help consumers connect with the winery's story and people both on site and out-of-market. "Balboa Winery is on the verge of some amazing growth on the heels of the unending critical acclaim of the Walla Walla Valley AVA." mentioned winemaker Thomas Glase. When Thomas Glase embarked on his personal winemaking journey in 2005 his goal was clear; create the finest wines in the world that showcase a sense of time and place. By combining an educated palate, training with premier wineries in the Walla Walla Valley including L'Ecole No. 41 Winery and Corliss Estates, and a unique blend of new world and old world winemaking styles Balboa has successfully created exceptional, food-friendly wines that are true to terrior, varietal and vintage. 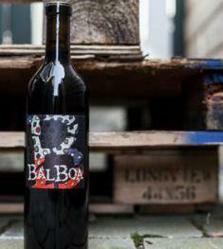 Over the past 7 years, Balboa Winery has grown leaps and bounds, and it just keeps getting better. Starting out with a focus on elegant, yet price approachable wines, the winery has grown to add higher end products from premier vineyards in the Walla Walla Valley, as well as custom crush wines for restaurants such as Metropolitan Grill, Kickin' Boot Whiskey Kitchen, and Public House 124. Balboa's winemaking team is also responsible for making the wines for Beresan Winery owned by powerhouse vineyard manager Tom Waliser. In 2009 Balboa purchased an estate vineyard, Eidolon, located in the renowned 'The Rocks' region of the Walla Walla Valley AVA. Planted in 1999, this 18-acre vineyard is located in the ancient Walla Walla Riverbed and is covered in massive basalt cobblestones, similar to the profile of vineyards in the Chateauneuf-du-Pape region of Southern France and is the growing region for many of the top wines being produced in the Walla Walla Valley. Balboa is excited to announce the first releases from this vineyard including a 2009 Estate Syrah, the 2009 Eidolon, and the 2009 Wraith. With the growth of the Balboa brand, increased interest in custom crush projects and the new Estate Vineyard program has come the need to expand the production team at the winery. This winter Tyler Grennan was appointed Assistant Winemaker. After graduating from the University of Washington, Grennan moved to Walla Walla to attend the Institute of Enology and Viticulture at Walla Walla Community College while concurrently working under Marty Clubb and Mike Sharron at L'Ecole No. 41 Winery to hone his winemaking skills. "We are excited for Tyler to join our team, his experiences at L'Ecole combined with his obsession with perfection will be serve him well at Balboa and allow us to continue to produce some of the finest wines in the world," mentioned Thomas Glase. Recently, Amy Glase also joined the team at the winery on a day-to-day basis taking over as the Managing Partner. A successful artist and fashion retailer for over 25 years, Amy brings a keen sense of style, a warm personality and an amazing collection of contemporary art to the tasting room gallery. In conjunction with many of the other changes taking place at Balboa Winery, a newly designed website has recently launched. Wine enthusiasts looks will now have an easier time locating their favorite Balboa wines both in our online wine shop, and at markets, restaurants and specialty wine shops in their region. Balboa has partnered with Achieva Marketing Group and Betts&Co. to enhance the Balboa Winery brand online, on-site as well as at retail. "Along with our growth at the winery has some the need to re-think our brand and ensure it is positioned for optimal success. This new website is one thing that we think exemplifies this growth," said Glase. "This site will allow us to reach out to our fans and wine lovers with concise information and compelling imagery. In addition, the new wine shop will be much more user friendly than before and allow us to streamline our direct sales channels." Balboa Winery is located just south of Walla Walla, Washington at the base of the famed Pepper Bridge Vineyard at 4169 Peppers Bridge Road. The wineries name pays a tounge-in-cheek homage to the rocky soils of the Estate Vineyard. For more information about the winery visit us online. Socialize with Balboa Winery online on Facebook, Twitter, and Instagram.